Probably the most trendy hybrid is a cross between a chihuahua and a daschund that goes by the enchanting name of chiweenie. The resultant dog has the same soulful eyes as the chihuahua and sometimes has enormous ears that give it a mouse like appearance. 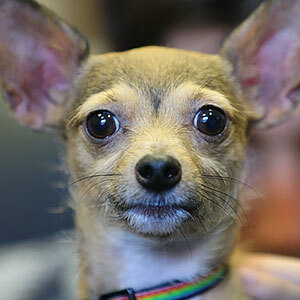 There are over 50 different chihuahua mixes, resulting in delightful names and even more delightful dogs with interesting looks and characters. It is not always possible to determine how a crossbred puppy will turn out as it depends on what characteristics it inherits from each parent. Dogs might also be multi generation crosses and not bred from two purebred dogs of different breeds. This means that there is a huge variety of designer dogs. Designer dogs are more affordable than purebred dogs and may be hardier than their pedigreed counterparts. Chihuahuas are undoubtedly among the cutest of dogs and chihuahua mixes have produced some equally cute offspring, both in name, looks and personality.